The Israeli Foreign Ministry reported that 12 Israelis remain unaccounted for following a massacre at a Las Vegas Music festival Sunday night. 50 people were murdered and more than 400 were wounded when a gunman opened fire at a country music concert at the Mandalay Bay resort just before 10:30 p.m. local time, in the worst mass shooting in US history. There have been no reports of Israeli casualties so far. However, 12 Israeli citizens are missing following the shooting. The Foreign Ministry is attempting to locate the missing Israeli citizens to make certain that they are unharmed. Police identified the gunman as 64-year-old Stephen Paddock, a resident of Mesquite, Nevada. 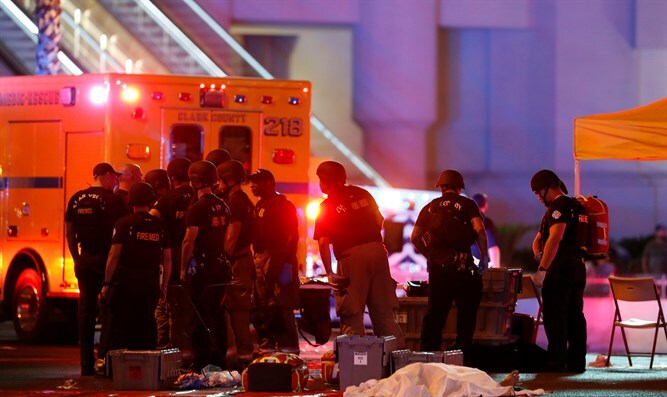 While initial reports claimed Paddock was a recent convert to Islam, Clark County Sherrif Joseph Lombardo said he had no knowledge of Paddock's religious beliefs. Paddock killed himself before police could apprehend him.